Gutter 'N' the Gulf offers a wide variety of services and products in addition to gutter installation. Listed below are some of the services and products we offer. ALSO ASK ABOUT OUR EXTENDED WARRANTY AND MAINTENANCE PACKAGES. Gutter 'N' the Gulf offers new gutter installation in a variety of colors and sizes including Seamless aluminum 5 inch or 6 inch gutter with a lifetime manufacturer warranty and a 5 year installation warranty and a 10 year warranty available extended maintenance package. Gutter 'N' the Gulf also offers gutters in galvanized steel, and copper(half-round and K style) as well as commercial box gutters and downspouts. Gutter 'N' the Gulf offers services to extend the life of your existing gutter and can even take old gutters down and reinstall properly or repair rotten wood and reinstall your existing gutters. Gutter 'N' the Gulf also repairs damaged or non working gutters as well as adding to (tie-in) to existing gutters if you wish to extend your existing gutters around a single corner or the entire house. Gutter 'N' the Gulf can match existing paint colors or paint to match if necessary for a minimal charge. Gutter 'N' the Gulf offer wood repair services if your home has rotten fascia or soffit Gutter 'N' the Gulf will remove the rotten wood and replace , seal, and paimnt to match new fascia and soffit before your gutter repair or installation. Gutter 'N' the Gulf maintains the highest standards of quality in installation and customer service. We guarantee our work in writing and promptly address any concerns or questions our valued customers may have. GUTTER 'N' THE GULF OFFERS THE ABSOLUTE BEST WARRANTY IN THE GUTTER INDUSTRY WITH LEAF CONTROL SYSTEM INSTALLATION OR ADDITION OF AVAILABLE ANNUAL MAINTENANCE PACKAGE. Gutter 'N' the Gulf offers a wide variety of leaf control systems to fit any budget, we offer aluminum and steel screen as well as top of the line solid metal covers to prevent clog problems. Gutter 'N' the Gulf offers free extended maintenance programs with any leaf control system installation and extends the installation warranty for your gutter installation to ten years. No one else in the industry offers this level of protection for your home. 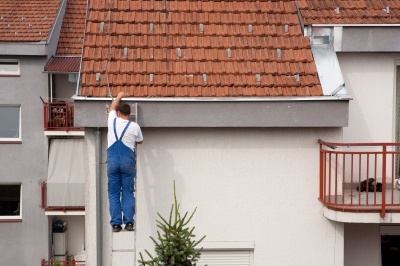 Gutter 'N' the Gulf also offers other gutter services including cleaning, and pressure washing. With purchase of extended maintenance program or leaf control system Gutter 'N' the Gulf will warranty your gutter to be maintenance free even if we didn't install the gutter on your house.